In today’s world of fast-paced technology, residents and business owners need fast and reliable computer services to keep their systems running smooth and efficient. 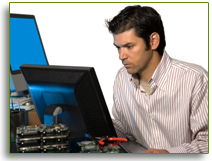 Geek At Your Door offers a wide variety of computer repair solutions to get your system up and running as quickly as possible. Our highly trained computer experts provide quality service at affordable rates in the comfort of your own home or business. Who has time to unplug their computer and bring it in to a store and wait 3-14 days before they get it back? Geek At Your Door will send a highly trained technician to your home and have most problems solved in as little as 24 hours or less!